A classroom demonstration brass monocular microscope with mirror and oil lamp, used by Oliver Wendell Holmes. It is mounted onto a wooden base with a heavy wooden handle. Object owned and used by Oliver Wendell Holmes. 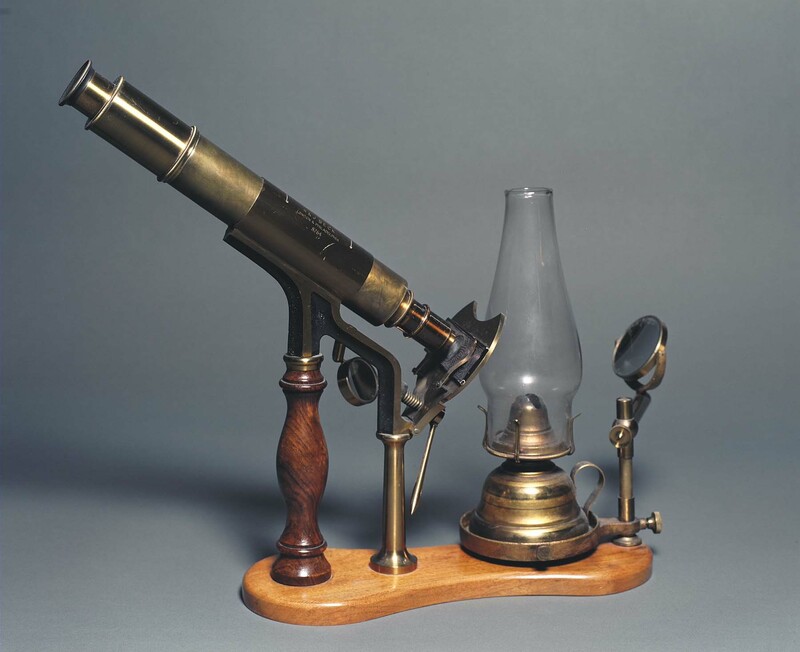 Microscope was later acquired by Harvard Medical School Department of Anatomy and was part of the Ernst-Lewis microscope collection. In May 1957 the Ernst & Lewis collection was placed on temporary loan to Harvard University's Collection of Historical Scientific Instruments while renovations were ongoing at the Medical School. In May 1990 the Dean of the Medical School made this loan permanent while allowing for the loaning of parts of the collection back to the Anatomy Department via the Warren Museum. CHSI 1091 was never physically transferred to Historical Instruments and instead has been on loan to the Warren Museum for exhibition. 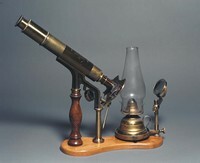 R & J Beck, London, Philadelphia, “R & J Beck classroom demonstration microscope,” OnView: Digital Collections & Exhibits, accessed April 22, 2019, http://collections.countway.harvard.edu/onview/items/show/6279.